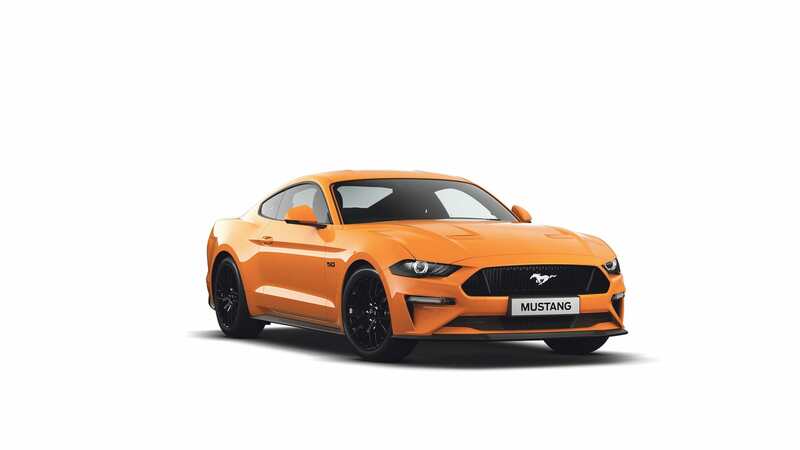 The pony-car phenomenon started back in the 1960s with trademarks that continue today: fully customisable styling, performance on a budget and visual appeal. The new Stang builds on this legacy with modern sophistication and superior power. As standard, the MY18 boasts a 226 kW four cylinder turbocharged engine with the option of upgrade to a 339kW V8 with 10-speed auto transmission. What’s else is new for 2018? 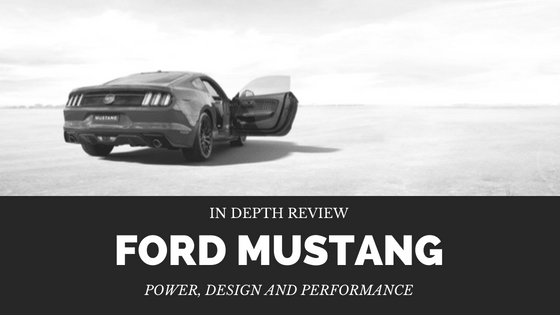 The 2018 Mustang brings with it a wave of changes, including enhanced powertrains and a full exterior redesign. The V-6 has all but been retired to make way for the turbocharged 2.3-litre inline-four the new standard. This sees a dramatic shift in torque to 441Nm compared to the previous turbo four (432Nm). The new base engine can be teamed with the all-new 10-speed auto transmission. Upgrades to the V8 add 33 kW (now 339kW) and an additional 26Nm of torque (up to 556). But it’s not all about power. More active safety assists come standard as well as adaptive suspension. Let’s break down the new features by section. There’s a new Le Mans-winning Ford GT inspired 12-inch gauge digital cluster that’s fully influenced by fighter jet cockpits and racing car dashboard visuals to be sleek and functional. Take full control of your Mustang’s exhaust noise and shift points. Play with the settings to customise your digital gauge layout and colours. Set your favourite driver settings with the memory function including your steering and suspension preferences. The centre console has been re-wrapped with contrasting hand-stitching and the bezels, rings and door handles given a clean aluminium finish. Drive away with new seating patterns or add factory-fitted six-way leather Recaro sports seating. Enjoy the new feature instrument panel with a new Mustang badge. Even the key fobs have been given an upgrade. The MY18 model gets autonomous emergency braking (AEB) with pedestrian detection as standard. There’s also lane-keeping assist, lane departure warning and adaptive cruise mode. Emergency Assist automatically notifies emergency services in the event of a collision. Your GPS Location is even fed directly to the call centre. There haven’t been any changes to the already outstanding 8.0-inch screen. On paper the EcoBoost turbo 4 cylinder somehow seems to produce 9kW of power less than it used to, but this is simply because of the new measuring system that has been adopted. Ford insists that both the MY17 and MY18 produce the same power. You’ll see torque increases up to 441Nm and as before, the six-speed manual transmission is available for the coupe. However, both the convertible and coupe can adopt the new 10-speed auto with paddles. Meanwhile, Ford announce the ‘thorough rework” of the popular V8 model (85 percent of sales) offering 33kW more power than ever with “the ability to rev higher than any Mustang GT before”. This 339kW power ceiling is thanks to the new injection system: “high-pressure direct injection, and low-pressure port injection.” Here, torque leaps 26Nm to 556Nm. According to Ford, the V8s manual gearbox has benefited from a total redesign “with a twin-disc clutch and dual mass flywheel”. All versions boast brand new shock absorbers. Ford also claims their new rear suspension system with a cross-axis joint teamed with new stabiliser bars increases lateral stiffness. MagneRide dampers are finally an option. Once only exclusive to the Mustang Shelby GT350, this system adjusts up to 1,000 times at each corner of the car automatically, factoring in road positions and driving conditions. 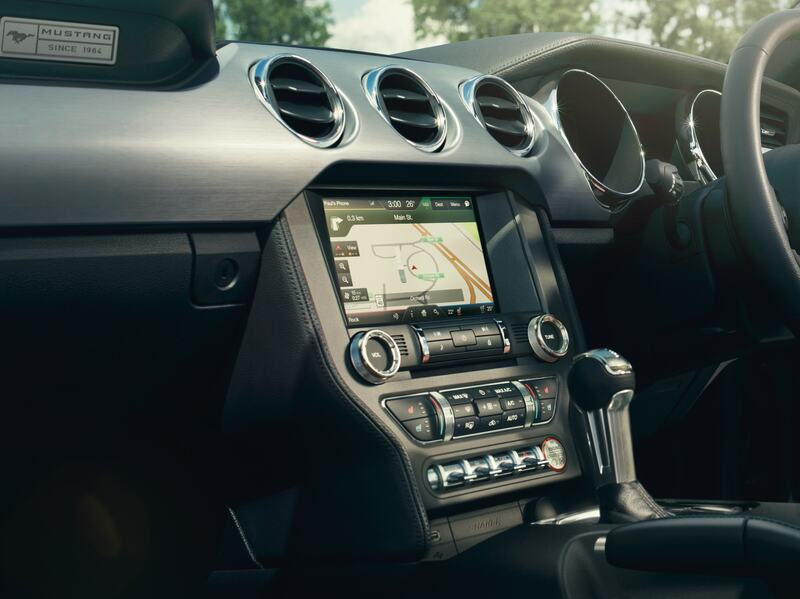 As standard, all GT models come with an all-new active valve exhaust system controlled on the new dash gauge system. Tailor your exhaust notes in Normal, Quiet, Track and Sport mode. The remodelled, grille and bonnet deliver aesthetic pleasure with “a leaner look and refined aerodynamics”. Not to mention the new lower and upper front grilles, and the repositioned bonnet air-intakes. For the first time ever, the full range of Mustangs will feature all-LED headlights and tail lights including “signature tri-bar lighting”. Additionally, a new fascia, bumper and optional performance spoiler are on offer. The V8 GT comes equipped with a black rear diffuser and quad-tip exhausts. The Mustang EcoBoost features the new alloy wheel design as standard. The GT brings with it the mesh aesthetic from the current version, while also offering a 19-inch alloy option. The new colour range includes signature Royal Crimson, Kona Blue or Orange Fury. Over the Top (OTT) stripe packages are also available. 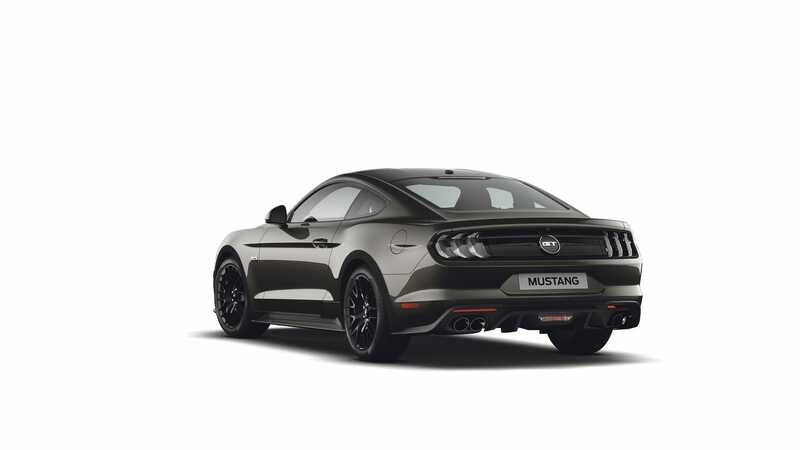 “The 2018 Mustang offers more factory-fit options than ever before, including a new single-wing rear spoiler (also part of the US-market Mustang Performance Pack),” Ford Australia claims. 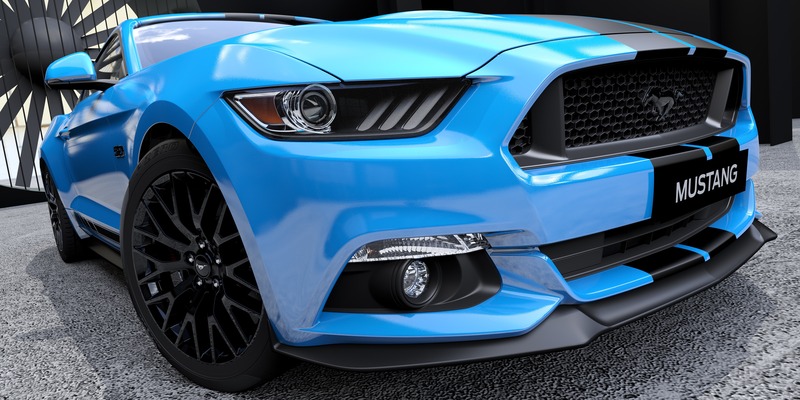 There are accessories available for the Mustang that will help this vehicle turn even more heads. Don’t settle for standard when you have a performance vehicle such as this phenomenon. There are various upgrades that you can add to enhance the look and feel of the vehicle. 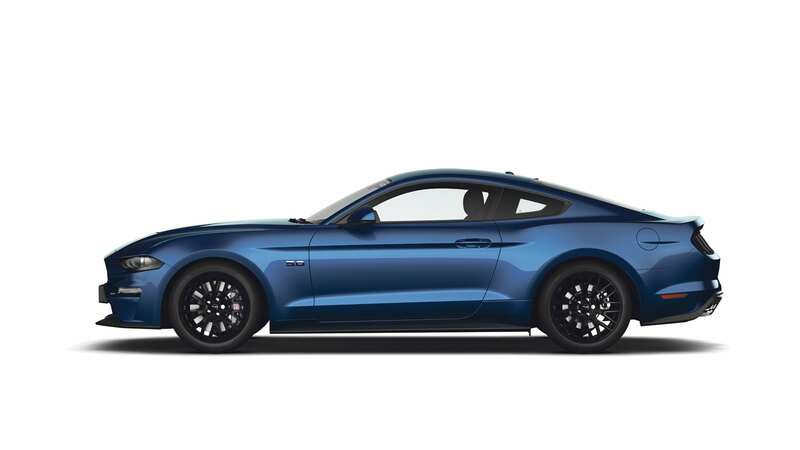 Interested in the Ford Mustang but not sure about finances? we absolutely have you covered with our free car finance calculator. To inquire about a test drive and the latest model contact us to make it happen. Call (08) 9415 000 today!